The feeling of pain in any part of the body can cause anxiety, because in this way the body informs the person that something is wrong. However, before panic begins to occur, it is better to understand the various causes of this discomfort. When a person feels pain in the sternum on the left, this may be related to the problem of one of the organs located on the left side of the chest: heart, lungs, ribs, stomach, esophagus. Pain is a negative feeling associated with physical or emotional changes in the body. In medicine, it is important because it is a symptom of many different diseases. The pain is acute and chronic, tolerable and shock-inducing. In the latter case, even narcotic analgesics can be used to take the person out of shock. The word “pain” is pan-Slavic, has related words in Indo-European languages: the ancient East German balo - trouble, illness; ancient indian bhal - to torture, to kill;Gothic balwjan - torture, torment. Pain // Etymological dictionary of the Russian language. - M .: Progress. M.R. Vasmer. 1964-1973. There are the most unfavorable places of localization of pain and to the left of the sternum - one of these. 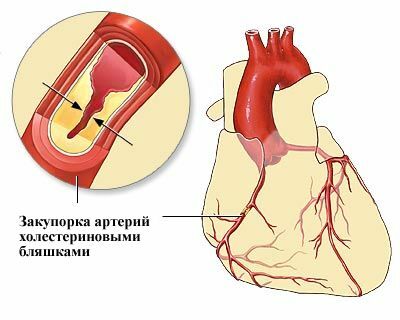 The heart and a number of other organs are located in this area, so a patient with similar complaints should be carefully examined for cardiovascular diseases. Video: Chest pain. Symptoms and causes. Diseases of the heart and large vessels. Lesions of the esophagus and stomach. As a rule, a person feels a sharp pain in the sternum due to injury as a result of an accident or if the person received a blow in the area of ​​this part of the body. 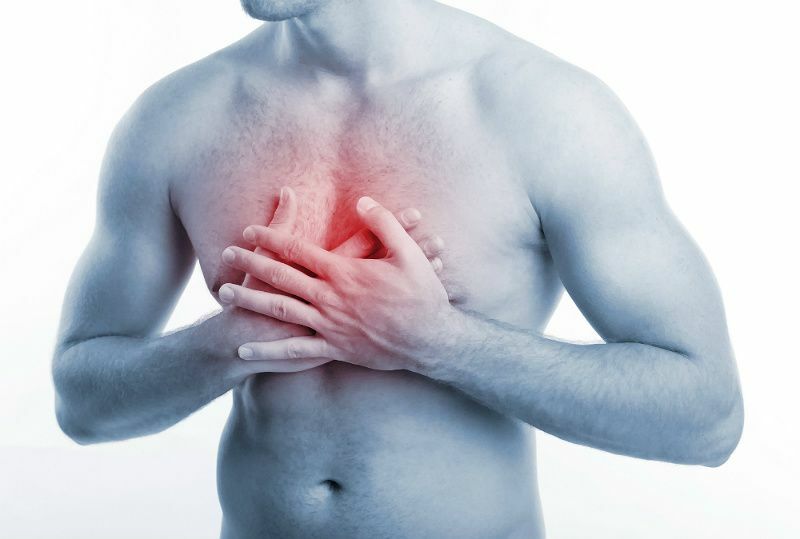 However, the heart and diseases of other internal organs can also cause chest pain. Therefore, it is important to monitor the patient's condition, look for other symptoms and then consult with a specialist, especially if the pain persists or, on the contrary, increases. Most often, pain in the sternum on the left occurs against the background of angina pectoris , pericarditis , precordial stroke syndrome, cysts, aneurysm . 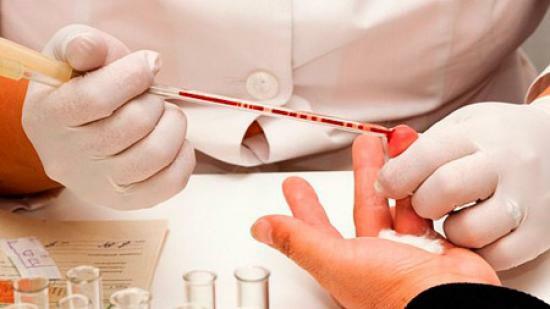 These diseases are extremely unfavorable and require timely treatment. Pain in the sternum on the left as a symptom often occurs with heart disease such as angina, which occurs due to a lack of nutrients and oxygen from the blood to the heart muscle. Angina pectoris belongs to the group of coronary heart diseases. The spread of pain in the back, shoulder, neck or lower jaw. The heart is surrounded by a thin membrane, known as the pericardium. When inflammation of the pericardium occurs due to a respiratory infection or for another reason, they talk about pericarditis. A similar disease can also develop due to autoimmune diseases, such as systemic lupus erythematosus, rheumatoid arthritis and scleroderma. Other possible causes of the disease are heart surgery, kidney failure, accidents, and improper use of certain medications. Severe pain in the chest, especially in the sternum on the left. In some cases, the pain is radiating to the shoulder or neck. The pain may become more pronounced when lying down, taking a deep breath and coughing. Other symptoms of pericarditis may include fever, fatigue, shortness of breath, heart palpitations, swelling of the legs or abdomen. The disease is not dangerous for the life of the patient. Most often determined in children and adolescents. Its occurrence causes a sharp, stabbing chest pain, which becomes more pronounced when a person inhales with a full breast. This pain can last from a few seconds to 30 minutes. The occurrence of the syndrome is associated with the compression of nerves in the chest. 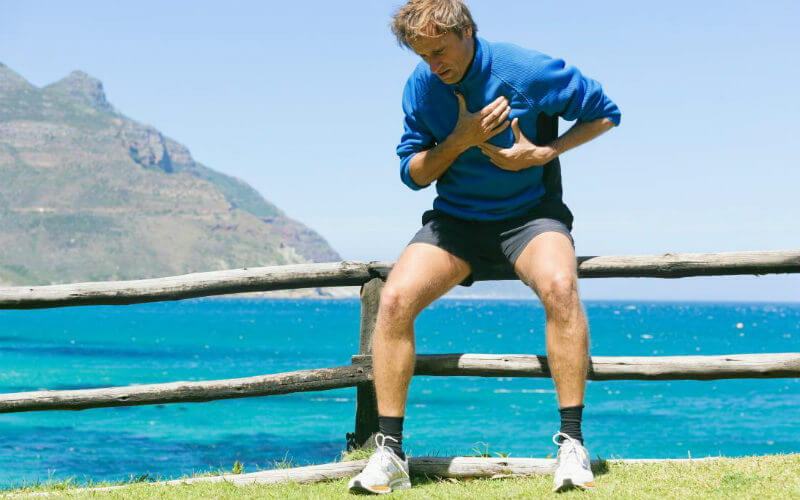 Most patients describe this condition as a tearing feeling in the chest. The relief comes, as a rule, after elimination of the squeezing factor.Unfortunately, this medical condition has not yet received affordable treatment, and the pain often disappears on its own. A cyst is an abnormal sac-like structure that can form in the tissues of the body, including the chest and near the ovum.This abnormal formation can cause a sharp pain of a permanent character in the left sternum, which can also occur from time to time. Discomfort becomes more pronounced if appropriate treatment is not carried out. When the gastrointestinal tract suffers due to the accumulation of gases, some of them may rise to the esophagus and cause an attack of acute pain in the sternum on the left. Excess gas can also accumulate in the colon, which causes the spleen to bend. In this case, the pain begins in the upper abdomen and spreads to the chest. A person may suffer from excess or ingestion of air for numerous reasons. The main risk factor for the development of aerophagia (swallowing air) is a condition in which a person eats the wrong, excited food and swallows too much air. This can happen if you do not chew food thoroughly or when you are talking while eating. Also, with a strong emotional shock, air often enters the esophagus, which also leads to aerophagy. Other causative factors are the use of chewing gum, the use of carbonated drinks and gas-forming products such as legumes, broccoli and milk. The disease occurs when inflammation of the inner layer of the stomach develops, which is usually triggered by Helicobacter pylori bacteria. Heartburn occurs when hydrochloric acid from the stomach is thrown into the esophagus. As a rule, this occurs when a person assumes a horizontal or inclined position immediately after eating. 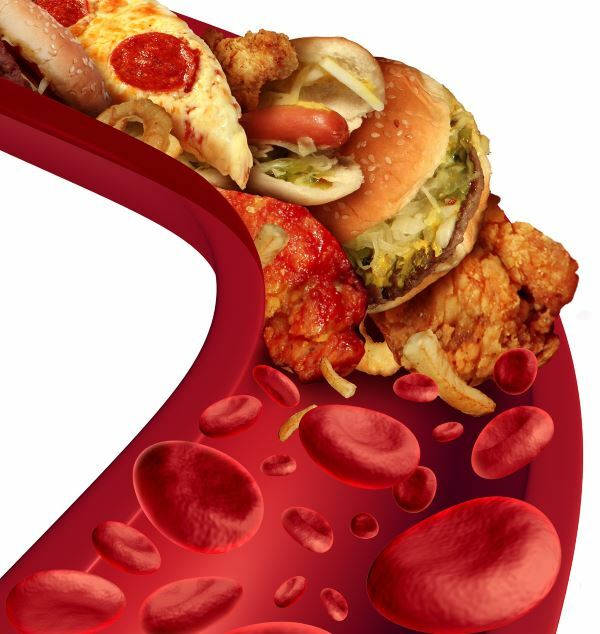 Fatty foods and carbonated drinks can also cause the development of this disease. The disease is treated mainly by conservative means, although in some cases surgery may be required. To connect the stomach and pharynx, the esophagus passes through a hole in the diaphragm, known as esophageal hiatus. The hernia of the esophageal orifice occurs when the stomach is pushed through the opening of the diaphragm and then goes into the chest cavity. Pain in the sternum on the left or in the center. The lungs are able to move smoothly during breathing due to the presence of fluid in the pleural cavity. She, in turn, like the pericardium, lines the place in the chest where the lungs are located. Pleurisy occurs due to inflammation of the leaves of the pleura, visceral and parietal. This may occur against a background of respiratory infection, injury or exposure to toxic chemicals. A person with pleurisy more often feels pain from the left lung, which can spread under the chest. Sometimes the pain is localized in the region of the left sternum, which may not immediately bring to mind the idea of ​​pleurisy. In such cases, the history of a person’s life and illness, as well as instrumental diagnostic methods, especially helps. Pneumonia is an inflammatory disease of the lungs that occurs due to an infection that affects the air islets (alveoli). The most common pathogen causing pneumonia is a bacterial streptococcal infection. However, microorganisms, such as viruses or fungi, can also invade and infect lung tissue. In the treatment of pneumonia, antibiotics are mainly used, which can be supplemented with fortifying agents. Damage to the ribs can occur when, due to an excessively strong impact, damage to the integrity of the bone occurs during an accident or other accident. Also, during exercise, using the twisting of the upper body, the muscles may squeeze the surrounding ribs excessively. Any damage to this part of the body leads to pain on the left side of the sternum. In addition, there may be other signs of injury or muscle tension, such as swelling, redness of the skin, and bruising. 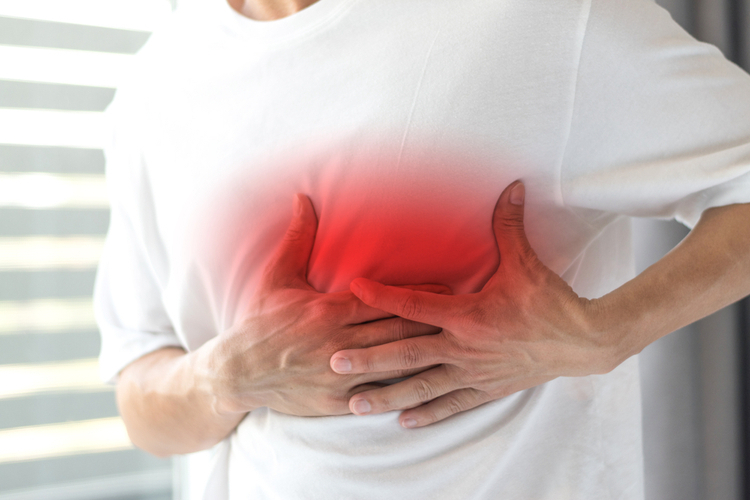 Costochondritis is an inflammation of the cartilaginous area that connects the sternum and the ribs. Occurs due to injury or infection. A person with costochondritis feels pain in the sternum, which worsens with a deep breath, coughing and sneezing. In addition, fever may develop, especially if the affected place has become infected. Stressful situations can affect various parts of the body, including muscles. For example, in a person under emotional or physical pressure, muscles that cause pain and discomfort in different parts of the body will tighten. In most cases, discomfort disappears after the elimination of the stress factor. The following risk factors can cause pain in the sternum on the left, but most importantly, they constitute a serious threat to the life of the patient, and, in the absence of first aid and medical care, can lead to death. Intensive therapy is often required, so it is extremely important to be aware of these conditions. Pain in the sternum on the left or on the right. Chest pain is not a typical symptom for lung cancer, like the other manifestations listed above. If the patient is a malignant smoker, and at the same time he is experiencing pain in the sternum or elsewhere in the chest, which worsens during coughing or laughing, then you should immediately visit your doctor or profile specialist. Unfortunately, the symptoms of myocardial infarction can be irregular, and in some cases even mild or ignored! If pain in the sternum is determined on the left or in another part of the breast, and at the same time it has never bothered before, you should immediately contact the ambulance. Especially it is not necessary to hesitate in the presence of shortness of breath or pain, extending to the left hand, back or lower jaw. In such cases, medical assistance should be provided immediately. Aortic dissection occurs when the wall of the largest artery in the human body begins to collapse. At the same time, blood flows between the inner and middle layers of the vessel. In severe cases, blood breaks through all the walls of the aorta and then the condition can become fatal. Aortic dissection is rare, but the increasing development of pathology concerns men between the ages of 60 and 70, who often smoke a lot and suffer from high blood pressure. 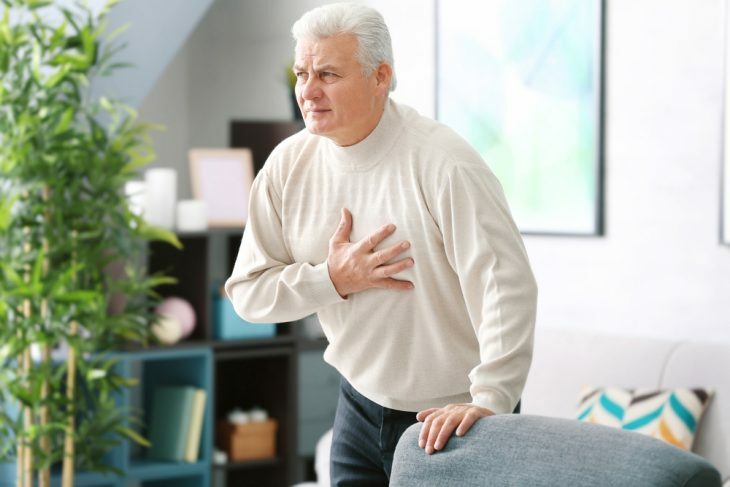 Symptoms of aortic dissection include pain in the chest or in the sternum on the left, which is severe enough for the patient to catch his breath when it occurs. The pain appears suddenly and feels like a feeling of some kind of inner break. Sometimes the pain spreads to some parts of the back, and the patient may faint. should immediately consult a doctor. In such cases, surgery is often required, as well as medication to prevent re-rupture. Trauma to the chest is often the cause of hemothorax, which is the entry of blood into the space between the lungs and the chest wall (pleural cavity). This condition can also occur in those with a blood clotting disorder, lung cancer or tuberculosis is determined. It is important to know that you need to immediately seek medical help if you have to experience these or any other symptoms, especially after an injury. Hemothorax is often determined after a car accident or a fall. To diagnose the pathology, chest radiography and computed tomography are mainly used. The treatment is aimed at cleaning the pleural strip of blood accumulated there. To do this, enter the chest tube to eliminate blood and re-expansion of the lung. Sometimes surgery is required. The disease occurs when the amount of air between the lungs and the chest wall increases. This condition is usually very painful. With the development of pneumothorax, the lungs, when trying to fill with air, cannot fully expand, which leads to difficulty breathing and severe pain. The condition can occur suddenly and without warning and then talk about spontaneous pneumothorax. It most often occurs after an injury accompanied by a rib fracture, or by direct penetration into the chest, for example, a gunshot wound or a stab wound. Pneumothorax can be the result of a disease such as pneumonia. Pneumothorax may vary in severity, with mild cases barely showing symptoms, and severe ones cause debilitating pain like a broken rib or a punctured lung. An x-ray of the chest is needed to diagnose the condition, and treatment includes simple observation and oxygen therapy with placement of a tube in the pleural cavity. The operation can be performed to prevent collapse, especially if pneumothorax occurs spontaneously. Pathology occurs when occlusion of one of the pulmonary veins occurs. This is usually associated with thromboembolism coming from the deep veins of the legs or the small pelvis. The blocking element can be air, fat, amniotic fluid, and even a surgical device - the latter is almost always the result of surgical or iatrogenic intervention. If there is a shortage of air, severe chest pain is experienced, which worsens during deep breathing, movement, cough, or there is a cough with a discharge of pink, frothy mucus like bloody sputum, you should immediately seek medical attention. This is especially true for those who have previously identified a pulmonary embolus or a person has recently made flights, was immobile for a long time, suffered an injury or surgery. Also at risk are pregnant women. Treatment of pulmonary embolism is based on the dissolution of a blood clot with the help of special preparations or its removal by surgery. Subsequent therapy involves the use of drugs to dilute the blood to prevent re-occlusion. Since various diseases and pathological conditions can cause pain in the sternum on the left, it is best to consult with your doctor to get the correct diagnosis and treatment. 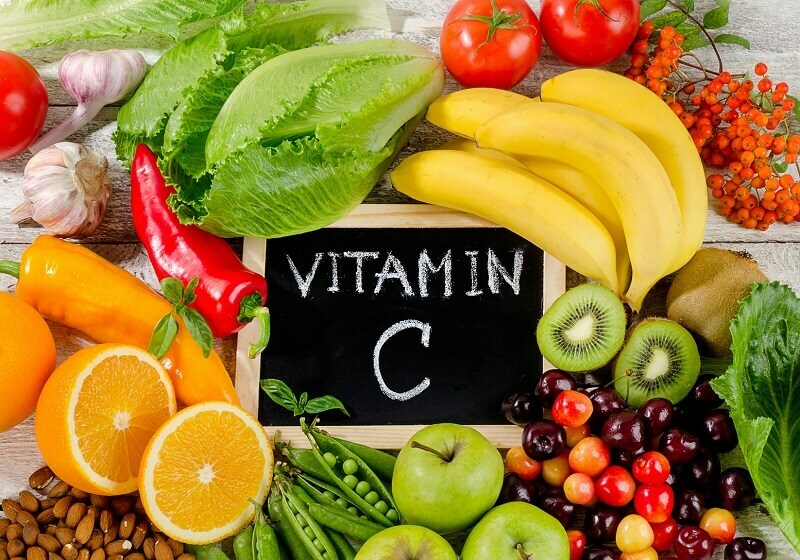 As soon as the main cause of the uncomfortable state is detected using instrumental methods of research, any of the following treatments and home remedies can be recommended. The occurrence of pain on the background of infection is most often eliminated with the help of antibiotic therapy. In the presence of inflammation nonsteroidal anti-inflammatory drugs (NSAIDs) are prescribed. Also, with the consent of the doctor, OTC pain relievers can be purchased. The best approach for treating cysts and chest aneurysms is to remove these abnormal structures by surgery. Also, surgery may be required in the treatment of pneumothorax, rib fractures, or hiatal hernia. Compresses are a general therapeutic tool used to reduce pain and swelling. However, you should know when ice or hot water can be used, because these two physical factors can have different effects. A warm compress can improve blood circulation, so it is ideal for eliminating pain in the affected muscles. You can also add a few drops of castor oil or Epsom salt while taking a hot bath, which provides a warming effect. Ice or cold application can have an instant effect in reducing the swelling of the affected tissue. 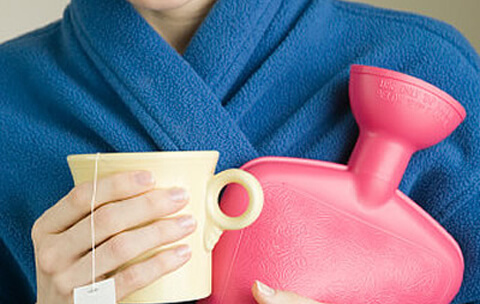 For this reason, a cold compress is most often used to eliminate pain caused by trauma or inflammation. Before use, the ice must be wrapped in a cloth or towel to avoid frostbite. Changing the diet in favor of the diet is useful in the case when the patient has excessive gases, gastritis, heartburn or heart problems. A daily intake of fiber-rich foods can help improve digestion and strengthen the cardiovascular system. You should also avoid eating foods that can irritate the stomach, such as carbonated drinks, coffee, alcohol and spicy foods. Finally, it is necessary to limit the use of fatty constituents, especially if there is heartburn or heart problems. Since an unhealthy lifestyle is a common cause of many heart and digestive problems, adjusting it to a healthy one will have a positive effect on the body. For example, you should regularly perform therapeutic and prophylactic exercises that can significantly improve health and physical condition. As much as possible, you should limit your alcohol intake and stop smoking if you have this bad habit. Stretching - one of the ways to strengthen the chest, ribs and abdominal muscles. This exercise can also help remove excess gases from the digestive tract. However, before doing any stretching exercises, you must first learn the correct way to perform these actions in order to avoid injuries. Also, if necessary, you should consult with a specialist who can help you choose the right set of exercises. The best way to deal with stress is to practice relaxation. In particular, you can try exercises such as yoga, jogging and swimming. Meditation can help psychologically and emotionally relax. Finally, the course of massage will help relieve pain in the sternum on the left and stress. 1. Боль // Этимологический словарь русского языка. – М.: Прогресс. М. Р. Фасмер. 1964-1973. Among all clinical forms of ischemic heart disease, special attention is given to myocardial infarction. It is this disease that often helps to disable, and in severe cases leads to death. Today's attention is focused not only on diagnostics, but also on the prevention of pathology, because not only the life of individual people, but also the quality of society in general, depends on it. What are the organic heart disease? In the course of various pathological changes in the heart muscle there are organic disorders that lead to the development of a number of diseases. In view of the complexity of the mechanisms of development, they are not always diagnosed, but the clinical course is, in general, much worse than with the same functional disorders. 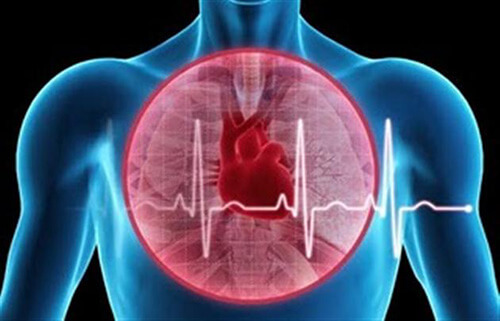 In order to correctly navigate the question of what are the organic diseases of the heart, the pathologies given by cardiologists are presented. The pain in the upper part of the sternum occurs for various reasons, and in each individual case, appropriate diagnosis and treatment is carried out. Sometimes it develops on the background of a heart attack, and then emergency medical care must be provided, otherwise serious complications can occur. That is why a proper survey should be carried out.